In today’s Wild West media environment of falsehoods and competing claims, how can students separate fact from fiction and judge the credibility of online information for themselves? That was one of the key questions addressed during the International Society for Technology in Education (ISTE) conference in San Antonio this week. And while there were no simple answers, participants agreed that — now more than ever — schools must teach students to become critical consumers of the information they find online. Fake news websites are proliferating, and they might have played a role in influencing the outcome of the 2016 presidential election. At the same time, many pundits and politicians — including President Donald Trump — have labeled articles they don’t agree with as “fake news,” even if the stories were published by legitimate news organizations. At the Sidwell Friends School in Washington, D.C., head librarian Angela Smith takes a very deliberate approach in teaching students how to be informed readers of online information, just as she does with traditional nonfiction sources. When teaching students how to read a nonfiction book, Smith — who co-presented a session on digital literacy at the conference — talks about the different aspects of a book and where to find certain information, such as the table of contents or the index. Similarly, when teaching students how to be effective online readers, she shows students where to find the copyright date, the source and other relevant information on a website. In both cases, Smith stresses that students must critically evaluate the information that is presented by asking questions such as: Whose voice is this? What credibility do they have? What information might they be omitting in making their point? She also takes students to hoax websites — such as DHMO.org, which warns of the dangers of “Dihydrogen Monoxide” (water) — to show them they can’t believe everything they read online. “They have that ‘aha’ moment, where they realize that not everything they see online is real,” she noted. Jean Pfluger, upper school librarian for the Duchesne Academy of the Sacred Heart in Houston, teaches students how to use the American Library Association’s CRAAP Test to evaluate online information according to five key criteria: currency, relevance, authority, accuracy and purpose. 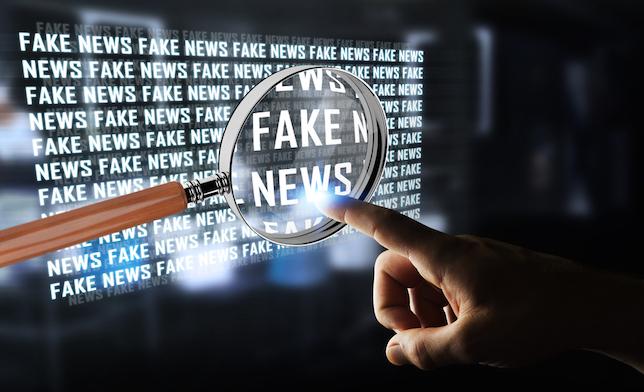 Pfluger believes the growing influence of fake news websites is proof that the role of school librarians and media specialists is more important than ever. Michael Morrow, a doctoral student in instructional technology at Sam Houston State University, said students must learn to corroborate the information they find online. “Just like journalists do, students should look for multiple sources to confirm a story,” he said. Many ISTE participants agreed that the current political climate, in which elected leaders and senior government officials seem to lie with impunity, makes the teaching of digital and media literacy even more challenging. In response to this trend, the American Library Association is reevaluating what “authority” means when applying the CRAAP test, ALA President Julie Todaro recently told the Huffington Post. “We talk about credentials in a different way. We talk about going beyond a title that someone has,” Todaro explained. ISTE participants also agreed that it’s impossible to keep up with the number of fake news websites that are cropping up online. “It’s a moving target,” said Joseph Wilson, an English teacher at the Science Academy of South Texas. Dierdre Shetler, an instructional technology teacher for the Cartwright School District in Arizona, said there is no way teachers can show students all of the disreputable sources of news and information available online. But exposing students to some of these sites and discussing what to look for in judging the credibility of online information can help, she said. Shetler recommends a resource from the nonprofit News Literacy Project to help teachers in her district address digital and media literacy. The resource, called Checkology, is a set of online lessons for students in grades 8-12. By working through these online lessons, students learn how to effectively interpret news and information “so they can make informed decisions about what to believe, share and act on — and ultimately become active members of civic society,” the website says. During the ISTE conference, Common Sense Media also announced a new resource to help combat fake news. The organization’s News and Media Literacy Toolkit assembles lessons, articles and other information geared toward students of all grade levels. The materials, which cover everything from fact checking to clickbait headlines, “give students the essential skills to be smart, savvy media consumers and creators,” Common Sense Media says.